At the core of Sixth Avenue Skatepark we have a desire to show love and learn from the teachings of Jesus Christ. 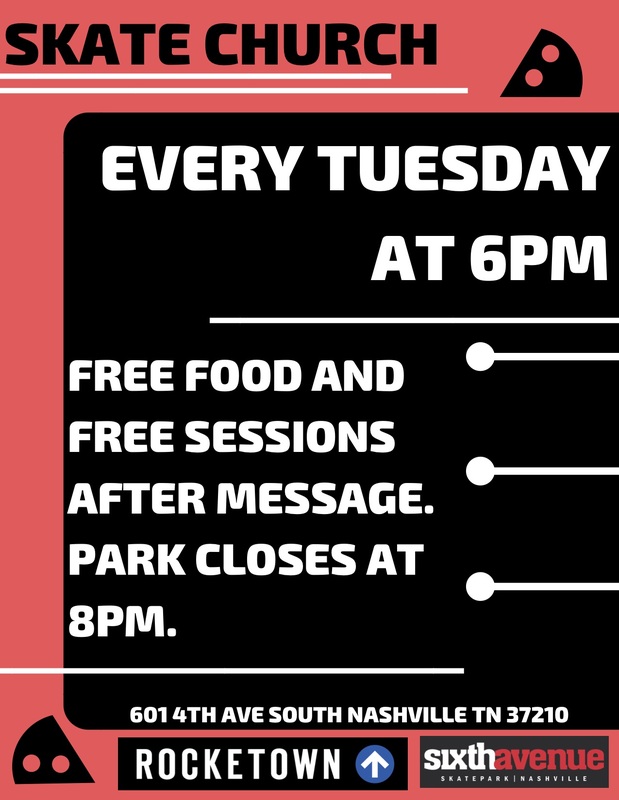 We by no means wish to force any of our beliefs upon you, but every Tuesday we come together and talk through part of the Bible… and we call it SkateChurch. SkateChurch is free and open to everyone. Every Tuesday night we spend 15-20 min reading the Bible and discussing a topic, and then skate together until we close. We also offer food and sometimes we play games, but we always have good discussions and a great time skating. If you have any questions please feel free to call the shop at 615-843-4006. For frequent updates on SkateChurch go and check out our SkateChurch FACEBOOK page.